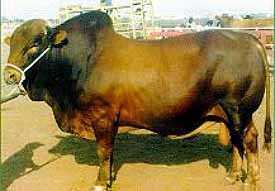 Afrikaner cattle developed from the native Hottentot cattle of the Cape of Good Hope in South Africa. 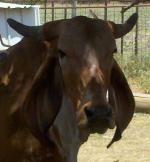 Afrikaners are medium-sized cattle with loose skin and large drooping ears. Bulls have the typical Zebu hump. They vary from a light tan to a deep cherry red. The animals have creamy white horns. The low maintenance Afrikaner is heat-tolerant and well adapted to withstand harsh conditions. Tick-resistance is quite adequate. They have a good temperament and are easier to handle than most Brahman-derived breeds.